Throughout most of last Friday's football game at Unionville High School, several television cameras from 6-ABC roamed the sideline, looking for highlights that would later be shown on “Action Huddle,”a summary of local high school football played that evening, that followed the 11 o' clock news broadcast. As producers examined the video that captured the 41-9 drubbing the Indians took against Great Valley, they likely did not find many highlights produced by the home team. In what Head Coach Pat Clark called the worst exhibition of football he'd seen his team play all season, the Indians were pummeled by a swarming Patriot defense, who blitzed Unionville quarterback Alex Pechin all night long, while Great Valley dominated the second half, racking up 34 unanswered points on their way to a victory that gives them an 8-1 overall record and 4-1 in the Ches-Mont American. The loss dropped Unionville to 5-4 overall and 3-2 in the Ches-Mont American, nearly vanishing any opportunity for the Indians to qualify for post-season play. Lost in the aftermath of a one-sided victory – and the self-directed vitriol of Clark's post-game comments – was that for the first half of play, Unionville – one could say Pechin's right foot – remained completely in the game. Despite an early blitz coming from the Great Valley defensive backfield, Pechin was able to engineer a drive that began at his team's 34 yard line, highlighted by pass completions to Chris Helle and Elan Nash that got the ball to within field goal range. With 6:56 left in the first quarter, Pechin kicked a 31-yard field goal to give the Indians a quick lead. On its next possession, Pechin followed up with a 39-yard field goal with just under five minutes remaining in the first quarter. Down by six points, Great Valley responded by going to one of its key offensive weapons, wide receiver Nasir Adderley. One its second play from scrimmage, set up in a wildcat formation, Adderley took a snap and sprinted up the right sideline for a 76-yard score. 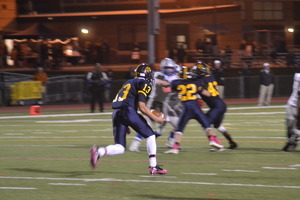 With time slipping by in the half, Pechin connected with receiver Marmo Tyler for a 35-yard pass, that set up Pechin's booming, 50-yard field goal – kicked directly into the wind – to send Unionville into the locker room with a 9-7 halftime lead. It was the last time Unionville was heard from. On the kick-off to open the second half, Great Valley's Jake Hubley took the return back 100 yards for a touchdown to give the Patriots a lead they would never relinquish. Although the run back score put a dent in Unionville, the entire momentum of the game seemed to shift permanently in Great Valley's favor when on a fourth-and-one from their own 29, Pechin was tackled after attempting a fake punt. A few plays later, a field goal by the Patriots' David Baugher gave Great Valley a 17-9 lead. Great Valley scored on its next set of downs, when with 3:25 remaining in the third quarter, quarterback Zach Ludwig found running back River Johnson in the end zone for an eight-yard strike. 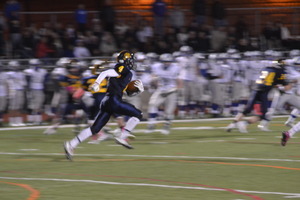 Down 24-9, Unionville was able to get the ball to midfield on its ensuing possession, but with just over a minute left in the third quarter, Pechin's pass was picked off by Adderley on the 36-yard-line of Great Valley and run back 64 yards for a touchdown. In the fourth quarter, Great Valley tacked on a second Baugher field goal and a 31-yard touchdown on an interception by Mark DeRobertis. The Indians wrap up their season with an Oct. 31 game at Oxford.